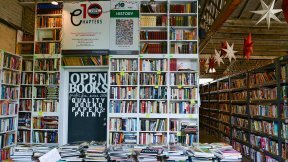 Approximately 3,000 Spanish language books are getting a second life at Open Books in Pilsen as a legacy project of the Librería Donceles. On January 12, 2018 from 6 pm – 9 pm, Open Books Pilsen, 905 W. 19th Street, will be hosting a free opening reception in conjunction with Second Fridays, with music from Sonorama and readings by writers from the Spanish language literary publication contratiempo. The exhibition of Pablo Helguera’s Librería Donceles at the Chicago Cultural Center in 2016 drew attention to the need for access to books and programming in Spanish. Throughout the 6-month run, the public was actively engaged in robust programming and encouraged to purchase books. 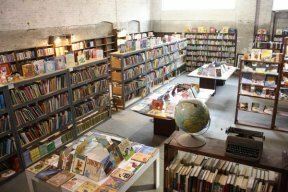 Originally slated as the final run of the installation, the excitement generated from the show and programs inspired additional exhibitions in Indianapolis and Boston as well as this legacy project at Open Books. Repurposing the used bookshelves from closed CPS schools and some of the original 20,000 used books from the Librería Donceles, the new installation at Open Books Pilsen creates a designated space within the Latino community for workshops and activities and is the only repository of secondhand Spanish-language books in the city. During the warmer months, the annex transforms into an open-air shop.